Our scented candles are ideal to add a wonderful ambience to any room and can help you relax and unwind. Hand-poured and made in England, add some candle-lit cosiness to your home with our luxury scented candles. With 60 hours of burn time, 100% natural vegetable wax and the finest ingredients, our special candles come in a sprayed white glass vessel and a lovely numbered box with a vintage inspired design. Soft white linen and a soft summer breeze. Enjoy moments of complete luxury with exotic Mediterranean figs, gently blended with woody notes from the eastern regions where figs are grown. 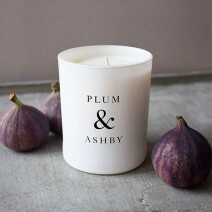 Soothe yourself to a better mood if you’re feeling a little tired and weary with a delightful Fig candle. This really works to help you sleep and for stress relief. Hand-poured by skilled craftsmen in the South of England, lovely blended wax and cotton wicks; these things make our scented candles special. Infused with fragrant scents, our luxury candles are environmentally friendly, burn cleaner and longer and help to add atmosphere to any room.